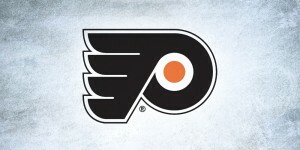 Yesterday, both the Philadelphia Flyers and the New York Rangers unveiled the jerseys they’ll be wearing on January 2, 2012 for the annual Winter Classic. 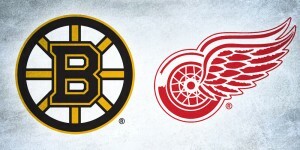 First my two cents on the Winter Classic itself: LOVE. IT. Outdoor hockey? What’s not to love? That is all. It’s awesome from a design standpoint too, as every year, both teams participating come out with a “new” vintage jersey, usually drawing from jerseys of their past. Although it may be a money grab on the part of the organizations, I love the idea of celebrating the history of hockey and some of these revival looks can be pretty great, from the powder-blue Penguins jersey (which now makes a semi-regular appearance during the season) to the ’30s era Blackhawks jersey. It’s fun to see those vintage looks out there skating in the open air. About the Rangers’ jerseys, I’m pleased as punch with their take. They were in a situation where their jerseys have actually changed very little over their 80+ year history. So, they opted for to buck the trend and create a “new” classic jersey design, with simple, extra-thick trim lines and a perfectly off-white base. 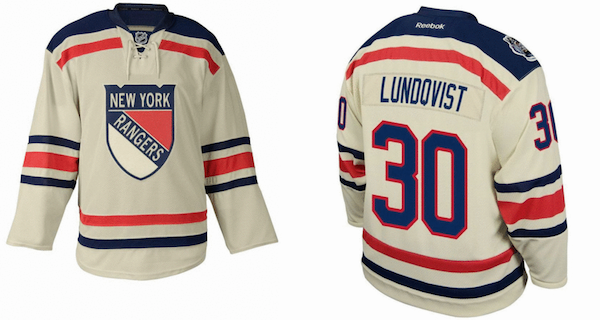 It looks like an old jersey, will look great on the outdoor ice and undoubtedly will sell well too. To me, an instant classic for this type of event. The logo itself, well, it’s okay. 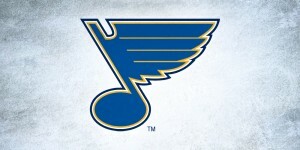 It’s a modified version of their logo from the ’30s-’40s. I’m not crazy about the design as it’s drooping lower than Droopy Dog’s jowls. But that’s a topic for another day. As for the Flyer jersey, meh. 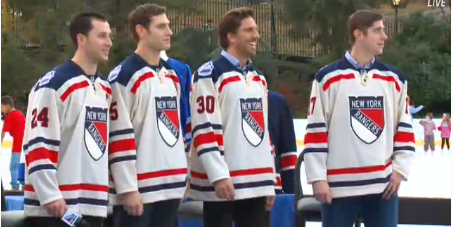 Admittedly, their look has changed even less then that of the Rangers, and they’ve already been to this dance once before in 2010, going with a jersey that is pretty much what they wear now. This new jersey for 2012 seems to try too hard to combine looks from their past and present, and then mix it with what looks like a slightly washed-out orange. The lines along the skirting are mixed, with one thicker than the other and not continued elsewhere. There’s not enough here to get excited about. What I would have loved is to bring back a modified version of the old Quakers’ jerseys from 1930-31. Apparently, quite a few people have thought the same thing and have created some for purchase. I’m assuming they’re, well, fakes and not of good quality, which is unfortunate. But it makes me wonder if the Flyers even own the rights to the Quakers merchandising, so that could be an issue as well. Anyway, as usual, I’ll be watching on January 2 as much for the aesthetics of seeing these jerseys as for the spectacle of watching a hockey game in the open air. I mean, really, how much awesomer can you get? As a side note, I think I’m one of the few people who loved the Calgary Flames uniforms from last year’s Heritage Classic. Watching the game, I actually felt like they were players time-traveling from the ’30s to play the Canadiens. Great scott, that was cool to see. Ballsy move, and it worked well. What’s your thoughts on these new jerseys? Want it sent back to the future past? Or have you already bought one?